CPSC just released fidget spinner safety guidelines, proving we can’t have nice things. 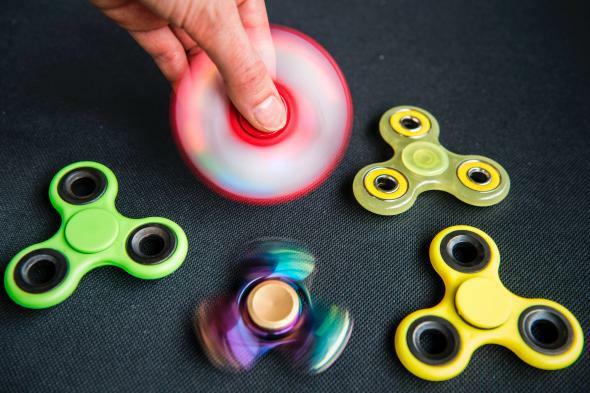 Along with “decline of civilization,” add “danger” to the list of reasons fidget spinners are bad for the youth: Two recent incidents reveal the mindfulness tool and classroom distraction can burst into flames and explode. Michelle Carr of Fenton, Michigan, told an NBC outlet in May that her Bluetooth fidget spinner caught fire while it charged on her bookshelf. Another incident in June in Gardendale, Alabama, ended with a screaming child dousing a flaming fidget spinner in the sink. Like the Samsung Galaxy Note 7s of flammable products past, the culprit seems to be the batteries: In both cases, the spinners were Bluetooth-enabled and were charging when they caught fire. On Thursday, Ann Marie Buerkle, acting chairwoman of the U.S Consumer Product Safety Commission, released a statement addressing reports of “fires involving battery-operated fidget spinners” and providing guidelines for usage. The regulations recommend being present when the batteries are charging, only using the charger provided with the spinner, and unplugging the spinner as soon as the batteries are fully charged—the “do not look into the sun” of safety recommendations. If their recommendations on the obsolescing toy seem uninspired, well, we’ve been here before. The CPSC has also released guidelines in response to reports of children choking on nonbattery spinners. The most notable of these accidents happened in May, when a 10-year-old girl from Texas needed surgery to remove a bearing from her throat. The CPSC reasonably recommends not putting fidget spinners in your mouth. You can imagine the eyeroll that accompanied the writing of that sentence. Fires and choking kids undoubtedly give ammunition to humbugs and culture critics. But the CPSC disagrees, noting “they can be fun to use,” and giving a list of ways to stay safe. Maybe instead of knocking fidget spinners, pick one up and let loose. Just make sure not to mistake it for a snack.